Wife recently shoved me into smart phone ownership. Mixed thoughts there but I'm making the best of it. 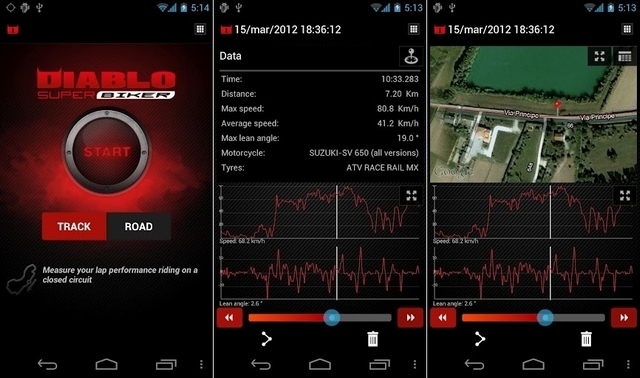 Question is, do you have any moto specific apps you'd like to recommend? I dl'd 2 so far. An angle app (mainly for Jeepin') and one for SPL. Stumbled on this one tonight - binarytoys.speedometerpro. Check out the vid and tell me whatcha think. I like the idea of a large speedo because the reading on the Duc is off a good 8-10mph. Osmond is great for following a route. Ride with GPS is good for plotting a route. Thanks! I use/have used Ride with GPS in the past. I'll check out the other 2. I've already started using the free google maps drive GPS which doesn't need a cell signal. I do not have/use a data plan, so I rely on wifi for that. I already have a dedicated GPS to use if needed, but I think I'll be able to figure out a work around. I bought the speedo app above ($1.99). I haven't driven with it yet. Time will tell. Found another really cool free app. It records data from the ride. Neat little feature lets you view your lean angle and speed during the ride. 1st use saw a 40 degree [email protected] 84mph. replacement mirrors that are useful!